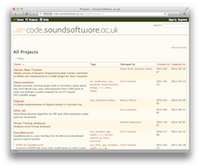 code.soundsoftware.ac.uk is a code-repository and project management site for software development carried out in the UK academic audio and music research field. It is intended to provide a useful facility for researchers who are making software in the course of their work, and for anyone who wishes to make use of such software in the future. We provide project management and hosting for source code, either published or private. 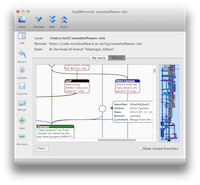 EasyMercurial is a simple user interface for the Mercurial distributed version control system. It's free, open source, and cross-platform. You can find pre-compiled versions by following this link. The source code repository can be found here.